Ambassador Francisco Madeira is a carrier diplomat with wide experience in mediation, conflict management and resolution. 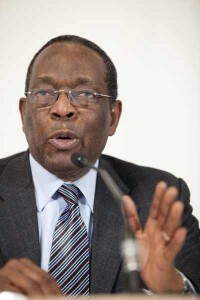 He joined the Mozambican diplomatic service in 1976 and was ambassador of Mozambique to Tanzania, Zimbabwe, Kenya, Botswana, Rwanda, Burundi, Comoros and Madagascar. Ambassador Madeira was member of his government’s delegation to the Rome peace negotiations which culminated with the signing of General peace agreement with Renamo which put an end to the country’s 16 Year bloody civil war. He then went on to integrate the UN led Commission entrusted with the task of overseeing the implementation of the peace agreement and prepare the path that would lead the country to its first ever multiparty parliamentary and presidential election. The success of this entire process allowed the country to enjoy 20 undisrupted years of peace and stability. Ambassador Madeira mediated political conflicts in Guinea Bissau and Sao Tome and Principe. He was member of formal Tanzanian president Mwalimu Julius Nyerere and President Nelson Mandela’s facilitation team in the Arusha peace talks on Burundi. These talks brokered a peace agreement and constitutional dispensation that eventually led to the demise of the recurrent ethnically based political violence in the country. Ambassador Madeira led, on behalf of the African Union, a mediation process that averted the dismemberment of the Comoros archipelago and put a halt to the never ending succession of military coups d’état in the Comoros. The process provided the country with a new name (Union de Comoros), a new flag and a constitutional framework adapted to the unique political and social conditions of the Comoros archipelago. Ambassador Madeira won a seat in Mozambique’s National parliament and went on to be minister in his country’s government for a consecutive period of 15 years.